Hello and Welcome to Day 2 (of 3) of previews for the June release for Sparkle Creations Rubber Stamps! Sparkle is releasing 2 new SCRS images and 1 new Karber clear set this Saturday! Today we are previewing a new Karber clear set, Magic. Do you recognize this famous wizard?! I am a big fan of Harry Potter as I've seen the movies and read the books countless times! I colored and cut out Harry and though you can't see it, I added some Glossy Accents to his glasses. 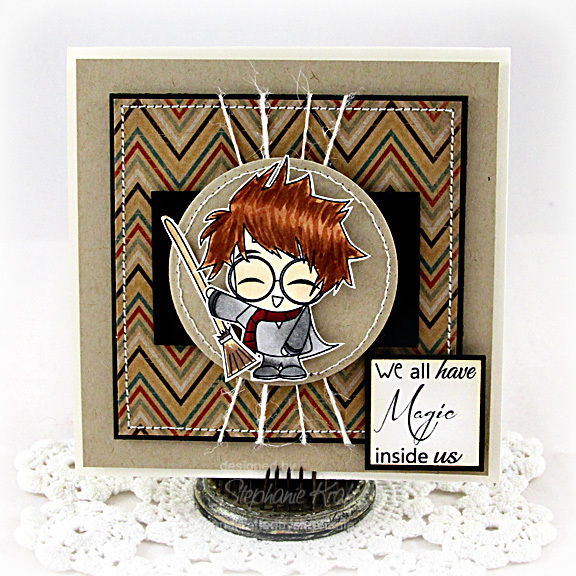 The set also comes with the sentiment "We all have Magic inside us" and a few accessories - I've added his trusty Firebolt! I used Jen's Deconstructed Sketch #54 for my layout. Be sure to visit all rest of the SCRS designers for more peeks of Magic. Sparkle will be giving away a Magic set to one lucky person! For a chance to win, you need to comment on all of the designer's blogs (list below). Then head on over to the and comment on the Magic post. You have until midnight EST each day to comment. The lucky winner will be announced the following day! I'll be back tomorrow with the final SCRS preview! Thanks so much for stopping by! Accessories: Standard Circle Nestabilities (Spellbinders), Square punches (EK Success), Markers (Copic), Glossy Accents (Ranger), Twine (May Arts), Foam tape, Thread, Sewing machine. Huge potter fan, such a perfect set! I like the kraft paper and coordinating colours you've chosen. Aww this is soooo cute!! Love your card layout, Harry looks awesome!! so adorable...love that chevron background.. This is ADORABLE Steph! LOVE the layout and papers!! So cute Stephanie! Love how you captured the highlights in Harry's hair! Have a great weekend! Simply too cute - love that paper!